A state of being is just a state. It is not really you—it is not Who you are, and it is not What you are. It is only the way you are being. When you say to someone, “That’s who I am,” you have told them about your state of being, not about You. Know that all states of being, whether sattvic, rajasic or tamasic, emanate from Me only, but I am not in them, they are in Me. When one sees the image of a face in a cloud, the form of the face is in the cloud, but the cloud is not a face. These three states are representative of the three modes of nature that cause all activity, gunas. Because we humans are identified with nature and consider ourselves to be doers of action, we get identified with these gunas. This superficial identity is a state of being. Guna – A single strand of a whole; an attribute, mode or property of nature (prakriti). A state is not really you—it is not Who you are, and it is not What you are. It is only the way you are being. Prakriti, the Divine Other-than-Y0u, seen from your viewpoint, looks like nature: stuff, things. The three gunas are the properties of this stuff, and prakriti is actually God. Lord Krishna has already identified Himself as Absolute God, but these states are not Absolute. Though God is both Absolute and Relative (verses 4-7), these states can only exist in the Relative because they are changeable. Anything that can change is relative, such as this world where everything is changeable and relative to everything else. 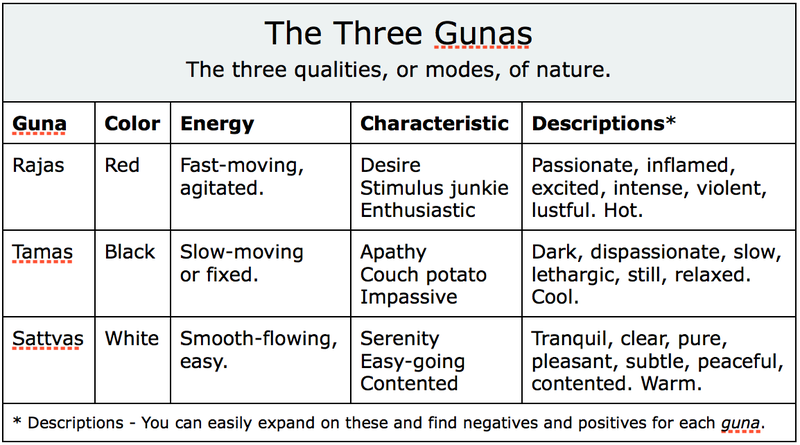 The gunas determine your basic state of being overall, and they also determine your state of being at any given moment. For instance, when you say, “I’m sad”, you are saying that what you are being is sad. You have identified yourself with ‘sad’. But you are not sad, you are being sad. When, throughout your day, you notice that you are experiencing something, notice that you are in this state, that this is your state of being at this moment, but it is not You. 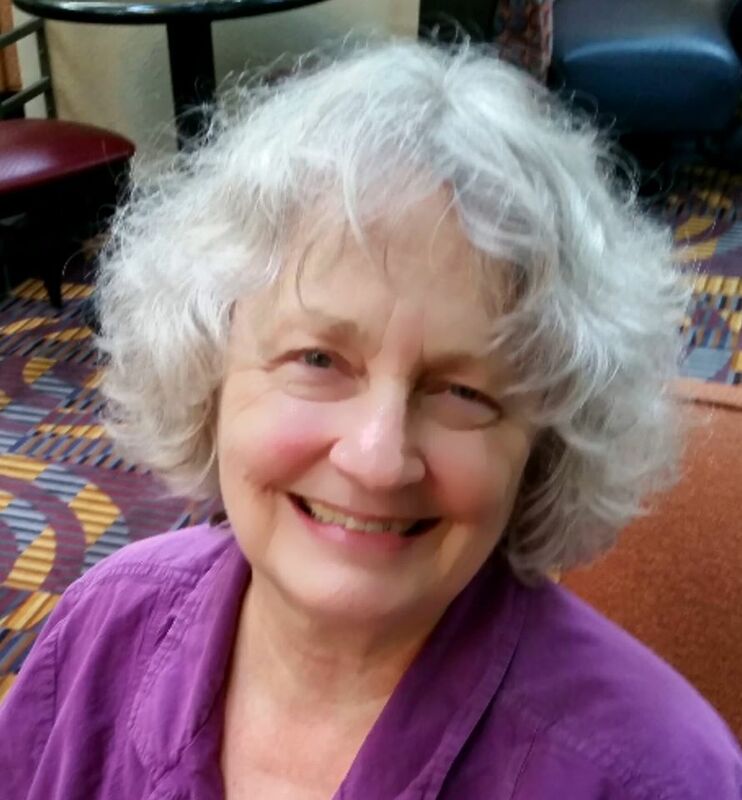 When you think “I’m angry,” try changing that thought to “I am being angry.” When you are feeling afraid and think “I’m afraid,” change it to “I am being afraid.” By noticing your experience and recognizing that you are in a state, you begin to loosen the chain of false identity with these states. You can’t be what you are looking at, so you are separated from it by simply noticing it. The gunas are often taught as goodness (sattvas), passion (rajas), and ignorance (tamas). But there is more to it that that. My eyes were opened to this by a yogic text I was reading many years ago. In it, the highest state of samadhi (union with the Absolute) was described as tamas. Whereas the usual sequence of gunas in relationship to the body is (from the bottom up) tamas, rajas, sattvas, in this text the sequence was rajas, sattvas and tamas. This intrigued me. Since I had reached the point of considering what I read in these texts to be true, even when they seemed to be at odds with each other, I considered that this difference must be due to the difference in stages of yoga. That the highest samadhi is tamas has since been proved to me through experience, so I am confident that this lesser known concept of the gunas is also correct. Because of these states of being produced by the three gunas, all this world is stupefied and unaware of Me, who am eternal and beyond them. The word for ‘eternal’ also means ‘unchanging, imperishable and non-decaying’. The reason we do not know God is because we are blinded by the three gunas of material nature—we take the face in the cloud to be a real face. What we see is real, but because we see it from a viewpoint, our view is limited and we see it for something other than what it is. This is the meaning of ‘ignorance’; the stuff we see is ‘illusion’. The whole world, bewildered by these three modes of material nature, finds my divine illusion to be unfathomable. Only those who surrender to Me transcend it. Science will keep on trying. But Lord Krishna has given us the key to making our way to the Real by reminding us that God’s existence as this world is inferior to His True and Absolute nature. So it is up to us to surrender to Absolute God to transcend, comprehend and get beyond our delusion. It is a choice we make. Or not.